This review also appears in one of my other blogs, www.dancescriber.blogspot.com, at this link. 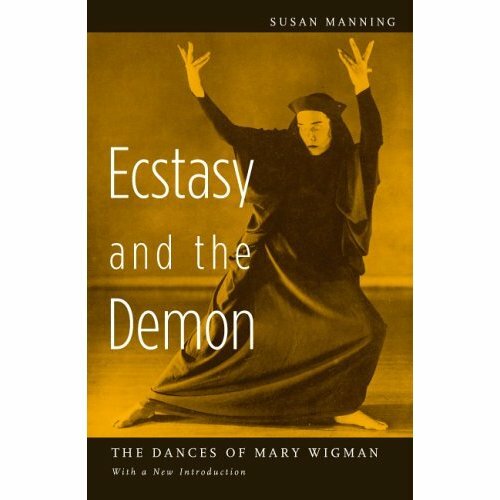 Susan Manning, Ecstasy and the Demon – The Dances of Mary Wigman  (Minneapolis: Minnesota University Press, 2006). Manning’s book is not just a groundbreaking analysis on Mary Wigman (1886-1973), but it also represents a fundamental shift in perspective in the field of dance studies. Manning does not take a mere biographical approach, but investigates the social and political events that shaped Wigman’s career as dancer, choreographer and teacher. Thanks to her research, we find out about Wigman’s influence on Rudolf Laban and his considerable influence on her, her work as choreographer of solo as well as group pieces, her controversial relationship with the Nazi Regime and her neglected reception in the United States. Wigman emerges as a prominent figure in German modern dance (the so called Ausdruckstanz, 'expressionist dance'), a figure who often had to struggle for the survival of her art. The initial phase of her career was very much influenced by the sense of community and freedom experienced at Monte Verità, “an artists’ colony in the Swiss Alps where Wigman spent the years of the First World War in voluntary exile with Rudolf Laban and his circle of dancers”. There she experimented her movement approach and managed to canalise her energy into a “working method”. The solo pieces resulting from this practice were quite radical and innovative. An example is Ecstatic Dances (1917), where Wigman presented the transformations of a character into, among other things, a nun, a dervish and a temple dancer. Through these transformations, she blurred the line between what was perceived as masculine and feminine, thus posing the question of gender construction. “The twenties were the great decade of Wigman’s career”: she opened a school in Dresden and successfully moved “from solo dancing to group choreography”. In this period her group was formed by women only (men began to be included in 1928). There she developed an approach to dance based on improvisation, Laban’s movement scales, spinning and circles. Group pieces from this period comprise The Seven Dances of Life (1921) and Scenes from a Dance Drama (1924), where the traditional narrative structure was eliminated in favour of a ritual-like vision, where she analysed the notion of (female) community. One of her most renowned solo piece from this period is her reconstruction of her 1914 Witch Dance (1926), where she wears a mask and a loose dress, seating on the stage floor. “Wearing a mask, the female dancer objectifies herself rather than allowing herself to be objectified by the (male) spectator”. 1930 was a critical year as Wigman passed “from a modernist to a fascist aesthetic”. This crisis reflects the larger crisis the Ausdruckstanz (expressionist dance) movement was undergoing. At stake was the survival of the movement, the preservation of its origin in physical culture and its relationship with “the discipline and theatricality of ballet”. In addition to this, economic problems were beginning to become a major issue and, when the Regime came to power, both the movement and Wigman had to face the difficult choice of either accommodating to its aesthetic or succumbing. With regards to this, Wigman’s proto-fascist work, Totenmal (1930), represented perhaps the first step towards what would always be her ambiguous relationship with National Socialism. Conceived as “a multimedia spectacle memorializing soldiers killed in the First World War”, it was done in collaboration with Albert Talhoff. The change in the political climate in the 1930s and beginning of the 1940s, led Wigman to shift her vision and turn it towards a more Duncanesque imagery, in that she staged a more traditionally seen feminine persona: “woman as wife and mother, woman as mourner fro the war dead, woman as heroic martyr”. Significantly, among these were the series of dances named Women’s Dances. As Manning herself states, “did her choreographic ambivalence serve as a limited resistance to fascist aesthetics or as a means of coming to terms with her accommodation?”. This remains an open and crucial question. The last part of Wigman’s career was characterised by a decrescendo, with her retirement from the scene in 1942 and the closing of her school in 1967. In 1957, however, she was given an important commission by the Berlin Minicipal Opera, to choreograph her version of the Rite of Spring, a landmark piece in dance history, first choreographed by Vaslav Nijinsky in 1913 with the music by Igor Stravinsky. Wigman inserted a female figure to replace the old sage. She called it a Mother Figure and surrounded her with two other female ‘mothers’, thus giving a unique taste to the piece. Manning highlights how this work embodied Wigman’s “self-mythologisation as the survivor, the victim of fate”. Wigman died in 1973, but her legacy survived in the rise of another movement approach to dance, that is Tanztheater, with figures such as Pina Bausch and Susanne Linke. The final chapter of this book explores the reception of Wigman in the United States, a reception filled with neglect and distortions caused by the North American strife to create a national dance idiom.